Targets are mounted on both target positioners to the normally installed Target Insertion Cryostat (TIC). The TIC provides the structural interface to the positioning systems, and also contains the on-board cryostat that is cooled by a high-pressure He compressor and on-board expander system (as well as associated instrumentation and heaters). 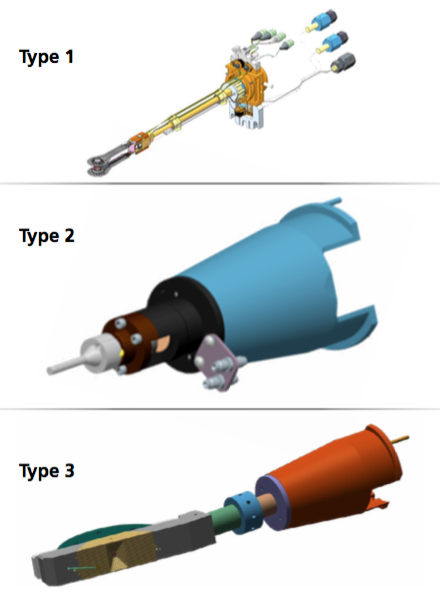 Three types of mounts are provided to interface targets to the positioner. Cold targets (and some warm targets) are mounted to the copper cold rod on the TIC via a target gripper base (Type 1, Figure 5-6). Most warm targets are connected to the TIC by a universal Kinematic Mount (KM) base (Type 2, Figure 5-6). Both of these mounts can interface with the TIC gas system lines (described below) to allow for target gas fills. A third type of mount is only used for mounting TARDIS (target diffraction in situ) targets (Type 3, Figure 5-6). Interface Control Drawings (ICD) AAA12-112562 (TARPOS) and AAA14-114368 (cryoTARPOS) describe the interfaces. Figure 5-6. Three types of target mounts. Type 1: Target Inserter Cryostat and gripper-based target on the cryogenic target positioner (cryoTARPOS). Type 2: Kinematic Mount base. Type 3: Target diffraction in situ (TARDIS) assembly and mount.